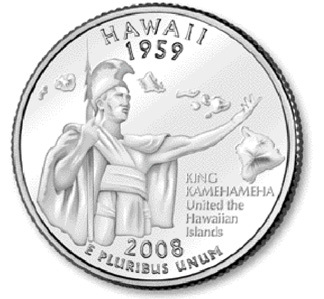 Here's how Wayne Takazono's winning Quarter Finalist drawing could appear if it became Hawaii's commemorative quarter. Star-Bulletin graphic artist Kip Aoki created an artist's rendering of Takazono's winning design. Penny for your thoughts. No, let's make that a quarter. Inflation, you know. The public has spoken in this latest round of Star-Bulletin State Quarter contests, and the clear favorite was -- drumroll, or maybe the sound of a slot machine making ka-ching -- Kaneohe artist Wayne Takazono's rendition of the King Kamehameha statue, gesturing across a splash of islands. Simple, clean, appropriate, elegant, recognizable. The Star-Bulletin's Quarter Finalist competition began in February with a call for sketches from wannabe quarter designers. More than 265 were submitted, reflecting a wide range of drawing ability and made-in-Hawaii themes. The paper's editors and artists narrowed the field to 12 finalists, chosen for the ideas reflected as well as skill of execution. All the images were printed on ballots published in the April 9 and 16 editions of the Sunday Today section. Over the two-week voting period, more than 650 people chose their favorites. 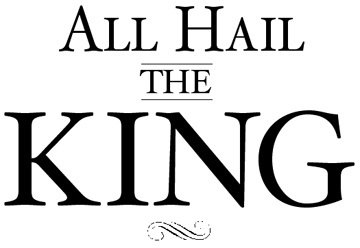 The King Kamehameha image was far and away the winner, receiving 282 first-place votes. Next closest was a hula dancer in front of Diamond Head, with 116 first-place votes. He receives 500 quarters -- $125! Score, Wayne. Do you need a wheelbarrow? Takazono admits he might have had an edge. He's a professional artist (portraits, landscapes) and, more than that, in the past he designed some coins for a Hawaii mint. "I worked up sketches for lots of designs and actually drew up a dozen or so before settling on King Kamehameha," said Takazono. "All sorts of Hawaii icons, like Diamond Head, hula girls, nene, surfing. I read up and asked opinions. Iolani Palace, for example, sounds good, but as a design, it's boring." In the end he went with gut instinct. "The representation of Kamehameha in the statue is an icon of Hawaii. It's not only a natural, it has real power, a reference that people can accept on the obverse side of a coin from Washington. I tried a full-length drawing of the statue, but that was needlessly complicated, and added the map of the Hawaii Islands because we're the only state that actually IS an island." That's right, Rhode Island does have islands, but it's mostly wedged like spackle between Connecticutt and Massachusetts. And Rhode Island dares to call itself the "Ocean State." Like, whatever. "We're only one in 50, so I had to consider the whole context of the state and come up with the strongest design I could," said Takazono. Department of Education spokesperson Greg Knudsen set an example by doing his homework. His uncluttered design of a hula dancer and Diamond Head struck a chord with voters, enough for a second-place finish. "I've been following quarter designs since they started and collect them too," said Knudsen. "I though we needed something to represent our unique culture, something that when a person on the mainland who pulls out a quarter in the dead of winter, it makes them dream of going to Hawaii." Knudsen said he was inspired by images of real hula dancers, not iconic kitsch hula. "Of course the mint will have the final say -- and how will they react to an image of a king on the other side of a coin featuring Washington?" wondered Knudsen. 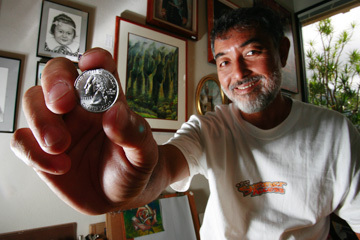 Artist Wayne Takazono won the Honolulu Star-Bulletin's "Quarter Finalist" contest by public vote and earned himself 500 quarters as a prize. In third place, it turns out the winner also did research. Hailing, like Takazono, from Kaneohe -- "Must be the weather out here!" -- Joseph Chung thought a lot about what makes Hawaii unique. His choice was Iolani Palace. "I researched and researched, and the palace is the most prominent thing in Hawaiian history," said Chung, a retired printer with a keen sense of graphics." Greg Knudsen's hula dancer took second place in the Quarter Finalist contest. The third-place winner, a design combining Iolani Palace and the Hawaiian flag, was submitted by Joseph Chung. The second- and third-place finishers receive nothing except the power and glory of appearing on these pages. And it might have an effect. Members of the Hawaii Commemorative Quarter Advisory Commission are well aware of this and past Star-Bulletin quarter design competitions, according to chairman Jonathan Johnson of the State Foundation on Culture and the Arts. "I'm looking at them right now!" said Johnson by phone. "What's fascinating about people's submissions is that, if you go back into history and look at coins that were minted in the islands, thay all had similar designs and subjects. There are just certain iconic elements of life in Hawaii that create visual standards." The lone exception, said Johnson -- the "shaka" sign. All these commisions can do is suggest a theme to the US Mint. Today is the deadline for submitting a theme. 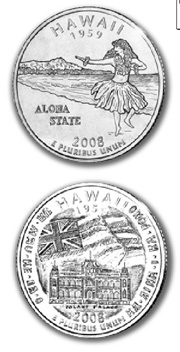 Go to www.hawaii.gov/gov/commemorativequarter and register your wishes on either the Web site, by e-mail or by fax. There's a space to explain your selection, a kind of 50-word essay. "I'm a little disappointed that our coin commision doesn't allow attachment of sketches on the e-mails. Other states did!" noted Knudsen. The site lists criteria for themes, including appropriate designs -- state landmarks (natural and manmade), landscapes, historically significant buildings, symbols of state resources or industries, official state flora and fauna, state icons or the outline of the state -- as well as designs that are inappropriate, such as the "state flag, the state seal, head-and-shoulders portrait or bust of any person, living or dead, controversial subjects or symbols that are likely to offend or logos or depictions of specific commercial, private, educational, civic, religious, sports, or other organizations whose membership or ownership is not universal." Got that? There's another opportunity for putting your coinage where your mouth is at a public hearing May 17 at the Hawaii Convention Center.